Drumpf.WTF combines a unique blend of humor and socially-conscious commerce to support those who resist Donald Trump's dangerous policies and rhetoric. 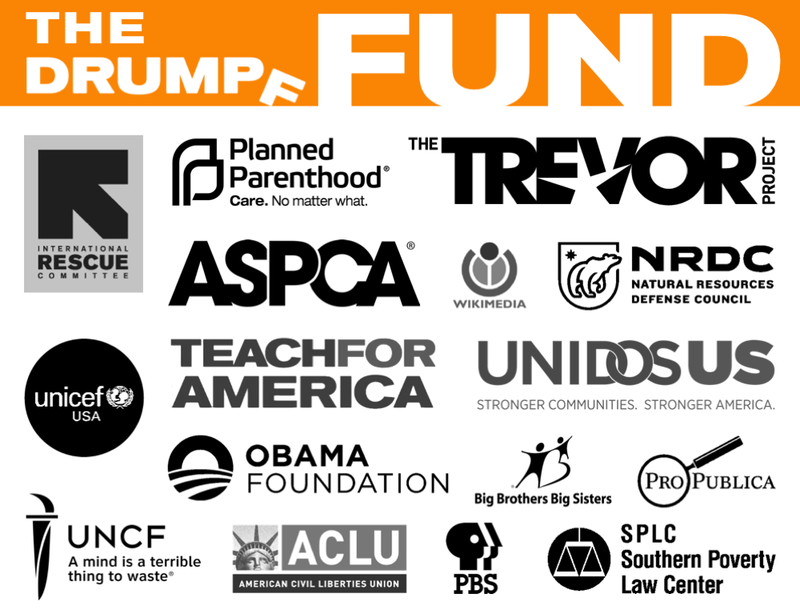 10% of all profits support Drumpf Fund, a hand-picked selection of non-profit organizations fighting for civil rights, equality, a strong free press and transparency in government. Our operation is small, but since 2017 we have donated nearly $3,000 to the organizations highlighted below. Even if you choose not to purchase from us we encourage you to research and support the organizations below. Phase I began November 8th, 2016 and requires us to PARODY this presidency, PROTEST this presidency and PREVENT this presidency from doing lasting damage to our nation. Phase II will begin after trump leaves office. We must RECONCILE our differences with each other, REBUILD our democratic institutions and REMEMBER how we got here so we never return.